We purchased the Frigidaire Compact 10,000-BTU air conditioner to use in the garage. Our son makes carts for handicapped dogs and his workshop is in the garage. We tried a portable unit before buying the window unit. It was a waste of time and money. We did have to hire someone to make a "window" in the garage wall, but it's been worth the effort. The unit cools and dehumidifies the space where he works and it's not noisy. This is a "Must Buy" if on a tight budget! I needed a spot to do my wood working and race slot cars. So my 450sqft, 2 car garage got turned into manland here in the South. I buried the ceiling and covered the walls and sliding door with insulation, then put 3 coats of epoxy on the floor(the cement dust was coming into the house in drifts). I needed a A/C unit to cool the space. The description goes into most of the key points, so I won't repeat them here, but a nice touch not described is the negative ion generation...it aids the collection of dust and makes the air quite pleasant(Like after a rain storm...all the negative ions makes it nice to breath). Installation was easy except for one caveat. The installation assumes you have a wood window unit. How you get around that is up to you. At $259, Lowes, Home Depot or GE couldn't compete, even with inferior units. I've been quite happy with my purchase. Does anyone know if this unit will recover by itself from a power failure? All previous units that I have owned do so, but current models appear to be electronically controlled and therefore sit there like a stone after a power dip. Imagine if your food freezer did that while you were out on a two week vacation? You would be cleaning up a pile of dead meat! I need a small AC to dehumidify my shop and I also want to leave it unattended for days on end. Anyone KNOW about this one? Others? I am very happy with this product. Amazon shipping was just great. The unit is a little on the loud side , but works great for cooling. I am cooling around 900 sq ft room and it does a very good job. The thermostat is great as it shuts off when it reaches the correct temp you have it set for. I was worried about buying this, because some reviews said it was noisy, but it's not bad at all. If you buy a window AC you can't expect it to be silent - I find it completely tolerable. I can even stand in front of it & talk to people on the phone without a problem. The fan is powerful, too. I never put it higher than low & it cools my apartment very well. I find the timer & other features very useful, especially remote sensing. I am really happy I bought this. My place is basically an M layout, with the AC in the farthest leg, & I can go in the other rooms without needing a fan. I'm still impressed by that. 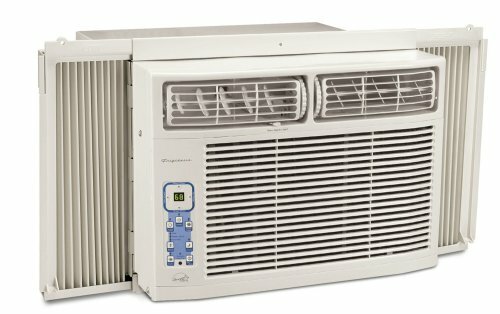 If you are shopping around because you're price-conscious, this is the best 10,000 btu deal you are going to get - everywhere else charges at least $50 of shipping & frequently more for the AC itself. You probably want a friend to help you install it, as it weighs 83 lbs. Installation for this AC unit is easy. It's a beautiful unit that works great. Very strong cool breeze even at the lowest setting. However!!! This unit is extremely loud. I have been turning the volume on my TV up because I just couldn't hear at the regular volume. Gets the job done but it is definitely loud. Not louder than other window mount ACs, but it is much louder than the wall mount ones with the cooling unit on the outside. I did not have the latter option and therefore, it was easy to choose this baby from the available options given also its energy efficiency. This is a great in-window A/C unit. The electronic controls are spot-on, the remote has a built-in thermometer and works exceptionally well, and it blows ice-cold air. I live in a 2BR apartment in Alabama with no central A/C system, and it works perfectly for my needs. It's also not an electricity monster: I installed it, thinking that my electricity bill would skyrocket...but a month after extensive and extended use, my bill's gone up a grand total of $1.12. I got the unit installed right before it got really hot here (perfect timing), but I don't worry about sweating it out in my own place. It's a workhorse, that's certain. Gripes: it does not automatically shut down when a given temp is reached. I may set its thermostat for 70degF, but it will not turn itself off when that temperature is reached. It's entirely possible that I missed that part when I read the (admittedly well-written) manual, but it ought to be intuitive enough to not require such research. The other gripe I have is with the quality of the unit I first received: like other reviewers, I had to send it back. I'm not sure if it's Frigidaire's fault or Amazon's shipping fault, but the first unit I received had a cracked interior fan head (so it was REALLY loud, as the fan whacked the fan head on each revolution) and the grill on the back looked like it'd been dropped. Like I said...not sure if it's Amazon or Frigidaire Q/A, but I had to send it back to exchange it for another. The unit is loud enough that you'll have to turn up the volume on your TV in order to understand dialog, but I've definitely seen/heard louder units. I purchased this unit in August 2008 and used it throughout the summer. I must say it cooled my large living room efficiently and kept it cooled even when I had the oven on. However, its fans are loud and now that it stopped working I wonder if that was normal. Evidently, there are problems with this unit as the company is arranging for a new unit for me. I bought this AC because of its power and energy efficiency, but those two qualities are exactly what make me hate it now. When it's on a cooling cycle, it noisily blasts arctic air until it hits the targeted temperature, then it completely shuts off! No fan, no blower, just off. Silence. Until the room warms up and the unit roars back to life. And it is LOUD!